Supposedly, since the first recorded ship to disappear in the Bermuda Triangle in 1779 there has been many seemly unexplained sinking and losses in an area what is also referred to as the “Devil’s Triangle. Fortunately, we live in the British Isles and we do not have such stuff, as an 'Area 51' of seemly-unexplained losses, - or do we? Ships do sink from time to time, during times of war and peace, also there are areas that are extremely hazardous to shipping in the world, but what is unusual is for numbers of ships to disappear in exactly the same location. But this is exactly what has been happened according to the Sites and Monuments Register kept by Kent County Council. For example there is an area of the seabed off the Folkestone and Dover coast in which the records held by the County showing eighty-four shipwrecks in three locations, each of which form a corner of the ‘Channel Triangle’. 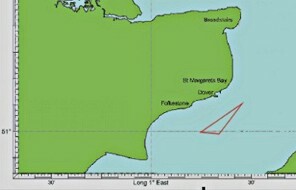 At the ‘Southern End’ of the ‘Channel Triangle’, the KCC records show that there are six nineteenth century shipwrecks, and five shipwrecks of the twentieth century. - These 11 vessels are recorded as sunk in position Latitude 50.9833359 Longitude 1.33333015. At the ‘Western End’ of the ‘Channel Triangle’, the KCC records show that there are eight shipwrecks between 1743 and 1760, and in the nineteenth century ten shipwrecks, and eleven shipwrecks of the twentieth century. - These 29 vessels are recorded as sunk in position Latitude 51 Longitude 1.25. At the ‘Eastern End’ of the ‘Channel Triangle’, the KCC records show that there are fourteen wrecks sunk between the years 1618 and 1773, and in the nineteenth century there are eighteen shipwrecks, and twelve shipwrecks of the twentieth century. - These 44 vessels are recorded sunk in position Latitude 51.066665 Longitude 1.45. What happened in the Channel in the 'Folkestone Triangle’, in Area 51? How are so many ships seemly becoming wrecked? Are there piles of ships stacked one on top of the other in the English Channel? So what happened to the ships that have been recorded as lost in the Triangle? Have you solved the Folkestone Triangle Mystery?